Yesterday I went to the stream that runs through the land where I live (the Holy Brook) and asked for her support. First though, I sang to her, as has been my habit since I moved here 3 years ago. It feels like the right thing to do. I don’t think about it, it just happens. I asked support and gave thanks to her and to all the beings that are the land and the ones that inhabit the land. I spoke intention and I spoke to what I was calling in/opening up to. I wanted the universe to know that there was space available for anyone who is ready to step forward and into a vision quest ceremony with me this Autumn. I touched the place of longing in me to offer this work and how much I love it, how at home I feel when I’m offering these ceremonies. When I felt the longing I also felt vulnerable. To allow myself to feel this much longing can be painful if it isn’t met by Life. Still, the feeling of it needed to happen rather than shied away from. My wish is to be authentic and be with whatever is arising in me so that I can also meet others and life fully. When my ceremony was complete I walked away from the flowing water and back across the meadow. I had an encounter with a rabbit who saw me but didn’t flee. I wondered whether he/she had myxomatosis but his/her eyes were wide and alert. Then I realized I was still singing. I believe it was the singing that somehow encouraged this little being to stay. It was a calming sound (for me anyway) so it’s likely it was calming for this one too. I continued on my way and went over to the incredible lime tree to see if she was bearing flowers yet. And she was. This felt like part of the ceremony somehow. I had been in a conversation with that one for a while, getting to know her and letting her know that I’d love to harvest her flowers when the time comes. 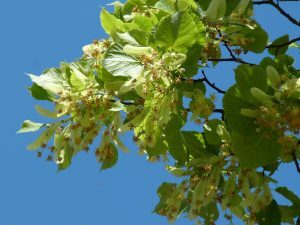 For those who are not familiar with the use of lime tree flowers, they can be used dry in tea as a calming, sleep inducing herb. Still singing this calm song (that in itself interests me) I began harvesting some of the flowers that were ready. I gave thanks and made an offering, saying I would be back for more. It feels as if I have been waiting for a long while for the flowers of this tree to blossom and now that they are, it feels like such a gift. This means I feel so much gratitude and connection with her – but only because I had been going there for some time and introducing myself, introducing my request to harvest from her. I can’t help seeing a connection with the ceremony I was in around the vision quest and this relationship with the lime tree. That somehow, unless I am in a connective relationship where I am in conversation and deep listening, the relationship will feel dry. And it is because of this flow of very simple events that I see how things come when they are ready and when nature and life are ready to offer them. My feeling for the quest is the same. Whoever is ready will step forward and into the ceremony wholeheartedly and offer their flowers to the world and the Mystery. And only when they are ready. May these ones know that a space is open, may they know how to listen deeply to themselves and respond to the call of the Mystery.